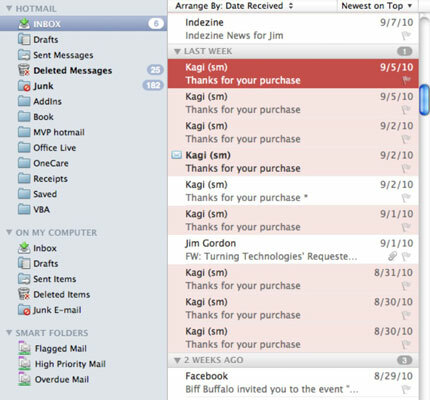 When you open Outlook 2011 for Mac, the program is in Mail view. 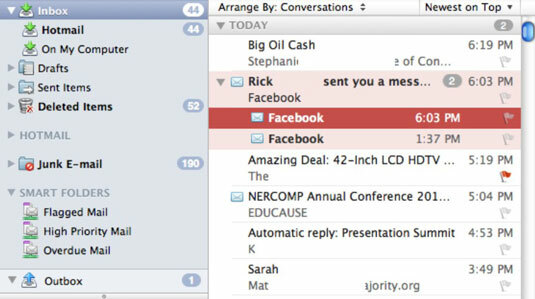 While Outlook 2011 for Mac is running, you can always see how many unread e-mail messages you have by glancing at Outlook’s dock icon and looking for the number bubble. Even when you press Command-Tab to switch applications, you see the bubble. Grouped Folders: Notice the organization of the folders. In this new arrangement, immediately beneath the Inbox you find On My Computer. If you have more than one account in your Identity, folders with similar names are grouped together. Arranged by Conversations: Messages are arranged by threaded conversations, meaning that all the messages regarding the same subject are grouped together. The default view setting is for message bodies to be displayed to the right of the list of messages, with the newest message threads shown at the top of the message list, which lies between the folder list and the message body. The subject of the message displays in bold if there are unread messages in the conversation. Messages that have been read are displayed in normal (not bold) font. To use the traditional folder/subfolder arrangement for your folder list, you have only one setting to change. Choose Outlook→Preferences from the menu bar. In the Preferences dialog, find the Personal Settings group and click General. In the Folder List group, deselect the check box labeled Group Similar Folders, such as Inboxes, from Different Accounts. Notice that folders under the On My Computer heading (meaning they’re not on the server, but saved locally on your Mac) are now segregated from the Inbox in traditional folders with subfolders.